First, take I-94 East(or M-14 East) to I-275 North. Next, take I-275 North to Seven Mile Rd. Get off at the second exit for Seven Mile Rd. called Seven Mile West exit! Then make a Right Turn which means you will be travelling west on Seven Mile Road. On your left hand side, you will see a "Andiamos" in the front parking lot of an office complex called " Seven Mile Crossing ". Make a Left Turn into the Seven Mile Crossing Complex and proceed to the stop sign that is directly in front of our building which is 38701 Seven Mile Road. Just park in the front or back and come up to Suite 285. Click here for further directions and maps . First, take I-94 West or I-96 West to I-275 North. Next, take I-275 North to Seven Mile Rd. Get off at the second exit for Seven Mile Rd. called Seven Mile West exit! Then make a Right Turn which means you will be travelling west on Seven Mile Road. On your left hand side, you will see a "Andiamos" in the front parking lot of an office complex called " Seven Mile Crossing ". Make a Left Turn into the Seven Mile Crossing Complex and proceed to the stop sign that is directly in front of our building which is 38701 Seven Mile Road. Just park in the front or back and come up to Suite 285. Click here for further directions and maps . First, take I-96 East to I-275 South. 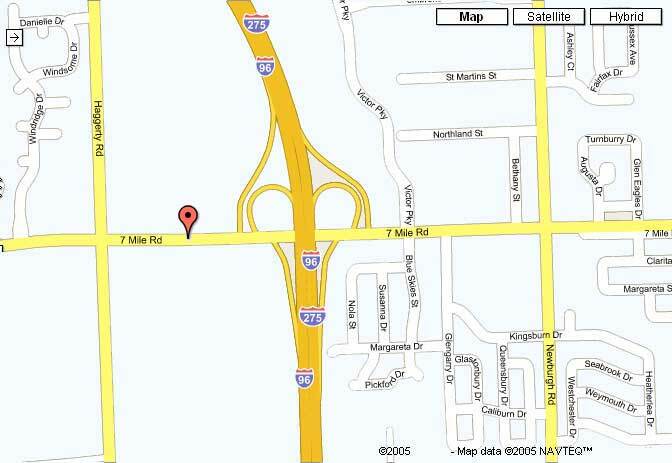 Next, take I-275 South to Seven Mile Rd Exit. Get off and the exit ramp and make a Right Turn. Immediately, on your left hand side, you will see a "Andiamos" in the front parking lot of an office complex called " Seven Mile Crossing ". Make a Left Turn into the Seven Mile Crossing Complex and proceed to the stop sign that is directly in front of our building which is 38701 Seven Mile Road. Just park in the front or back and come up to Suite 285. Click here for further directions and maps . First, take I-275 North to Seven Mile Rd. Get off at the second exit for Seven Mile Rd. called Seven Mile West exit! Then make a Right Turn which means you will be travelling west on Seven Mile Road. On your left hand side, you will see a "Andiamos" in the front parking lot of an office complex called " Seven Mile Crossing ". Make a Left Turn into the Seven Mile Crossing Complex and proceed to the stop sign that is directly in front of our building which is 38701 Seven Mile Road. Just park in the front or back and come up to Suite 285. Click here for further directions and maps .